Why is Sugar so afraid of men? Why won't Chloe won't let me touch her chestnut? What did Gabe look like as a baby? While those questions may never be answered--but when it comes to tracing a horse's past, we thoroughbred owners have a leg up on many other breeds and registries. There's so much information out there! In researching a thoroughbred's past, you start by confirming the Jockey Club identity. The tattoo, Jockey Club paperwork, and the information from the past owner will be helpful starting points. Not all tattoos are readable, and not all thoroughbreds have tattoos -- generally just those that go to the track, train and have been entered in a race. If you know the horse's race name, you don't really need the tattoo. If you can get a partial tattoo, the Thoroughbred Racing Protective Bureau may be able to help. Sometimes you just don't have enough to work with, but if you have a few facts to start with, here are still some basic approaches to try. Thoroughbreds are well-documented animals in general, from breeding to performance. For U.S. bred thoroughbreds, take a look at Can I find out about my ex-racer's background? to get racing performance/bloodline info. Most folks are already familiar with Thoroughbred pedigree query database, which provides pictures, pedigrees, and other information about lineage and performance. If you know where the horse raced and/or what races the horse won (date, etc), you can contact the race track (most have Web sites) to see if there is video footage of the race. Race replay videos from over 70 racetracks are available through a database called www.racereplays.com but there is a fee. Winner's Circle photographs may be available from the track or the track photographer, who is often listed in the Contact Us section of the Web site. 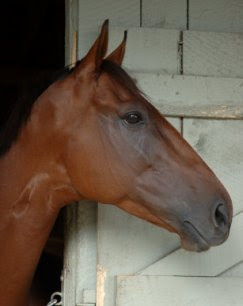 Racehorsephoto.com partners with many different racetracks, collecting photos to create one searchable database. For free (selected reports) or for a small fee, you can find out a lot on the vast thoroughbred database Equineline.com. For example, I got a list of all of Harv's siblings, including one full sibling. I searched high and low for Harv's brother on the Internet but never found him. I found one half-sibling competing at 4th level in Minnesota. If the horse, his sire, the trainer, or breeder is successful, you might find reference to them in publications such as Blood Horse, Thoroughbred Times, or other publications. If all else fails, put an ad in regional equestrian or racing publications seeking information on your horse. You never know who might respond. Believe me I'm no racing expert! I may well be missing some great resources -- if you know of one, or some, feel free to comment! www.racingpost.co.uk and www.racingpost.co.uk for free database searches/race records going back up to 30 years. Mostly UK, some US. Racehorsephoto.com partners with many different Thoroughbred and Standardbred racetrack photographers to create a database of photos. www.racereplays.com "With over 70 tracks and growing,RaceReplays.com is the only comprehensive VideoCharts™ Internet site, offering members the ability to view unlimited individual Race Replays, Photos and Results from North America’s leading racetracks." Love my Thoroughbreds! Neither one of the current pair raced and I do know much about their backgrounds. New horse is an American Warmblood...grade mare, double registered stallion...and I have some baby pictures!! Saw my older guy as a baby and adopted the middle guy as a yearling. It is fun to know as much as you can about your horse. Often time a simple Google search can turn up your horse's results and identify their trainer. Some trainers are delighted to find out where their horses ended up. I've also found that posting on bulletin boards/forums (COTH is one, Alex Brown Racing is another) can help you track down information. Many of the folks who post there have memberships to the racing associations and can give you more in-depth information about your horse. Someone I "met" through my blog ran the race results on my current horse and I'm now going to get some "win" photos of him! I love going through the Thoroughbred websites to check out where my colts siblings are at. One of my colts half brothers "master of Disaster" sold for $600K. . the full blooded sibling (with a track injury) I found on a horse sales website for $5K. I love pulling up the pictures of the family just to get a idea of what my boy is going to look like when he gets older. . . it also makes my $500 purchase price seem like such a steal! If only horses could talk. My old vet said that he used to think that TBs were dragged about by the ears at the track (twisting the ears to get control) because so many of them were ear-shy. Then he raised one from birth and it was just the same. My TB is not funny about her ears, though, but can't bear to have her mane pulled. You've put out some really good resources I haven't seen before. Thank you. I look forward to some good surfing! You got me so excited Stacey...but my horse is too old to be on either of those websites. Thank you for that information though...This post would have saved me a lot of internet searching when I first got Gen!